Having definitively proven earlier this year that the Winos are experts at telling reserve wines from their non-reserve counterparts, we decided to take a stab at tasting back-to-back vintages of the same wine and trying to guess which was which. Theoretically, this should be a pretty intuitive process: whichever one tastes more “settled in” is the older of the two, right? 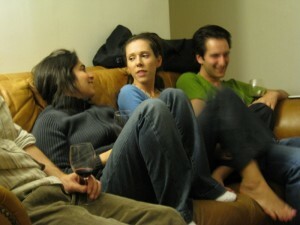 In the case of red wines, for example, the younger, less settled bottles may have harsher tannins, sharper acid, and more rambunctious fruitiness. However, these traits can also easily be influenced by climactic factors, so a blind tasting of back-to-back vintages isn’t always the exercise in obviousness that one might expect. The good people at Wings Winery sent us two subsequent vintages of their celebrated Napa Cab, so I brought it along the night we drank all those Roussannes. After downing three robust whites, however, would we have the keen perception necessary to tell the two vintages apart? There was clearly only one way to find out: drink them at once, and ask questions later. The palate was a crowd-pleaser. Dark and rumbly, the wine featured big notes of dirt, tar and earth. Dylan enjoyed the richness of it, and thought that it actually approached “the brink of raisiny porty-ness.” Andrew thought it felt a bit slight for a Cabernet, and claimed it could’ve used more body, but he enjoyed the flavors nonetheless — flavors which Jessica reviewed favorably as “black cherry mashed up with dirt.” I got some Angostura bitters character as well, which I found pleasing (but which Sasha derided as “a bit vegetal”). Several tasters picked up a flutter of blueberry on the end, and overall reaction was quite positive. 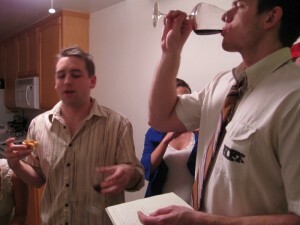 Wine #2 was poured, and claims of “riper” immediately emanated from the assemblage. A few people observed notes of candied plums, while Sasha picked up some molasses and peat moss. I got some notes of mud puddle, blackberry jam, and even a hint of that distinctive smoke that mysteriously wafts from below the streets in Manhattan (not at all an unfriendly association for anyone who harbors fond memories of time spent there, as I do). We all gave it a taste, and notes of “red berry character” and “charcoal undertones” were bandied about. 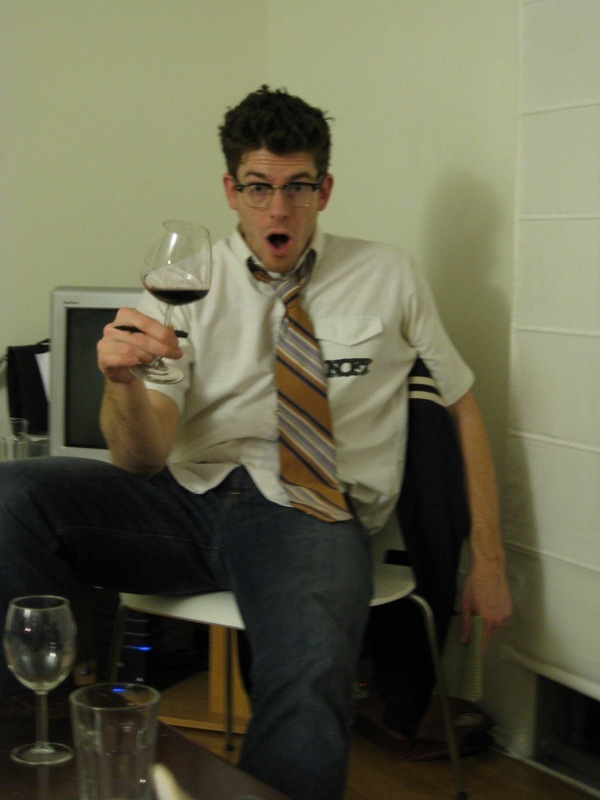 Dylan picked up some black olive notes, and he complimented the chalky, mouth-coating tannins. Everyone agreed without much hesitation that this bottle tasted younger, though opinion was split on which had been the favorite: “call me Robert Parker, but I like this one better,” said Dylan, while Jessica found it “too chalky,” and Sasha said it tasted “less complex and nuanced” than the previous bottle. I really enjoyed the big purple plushness of it, but I agreed that it tasted a bit more manic than Wine #1. 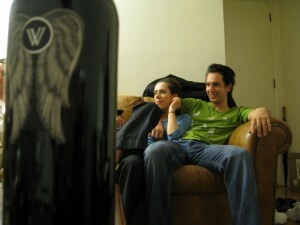 To no one’s surprise, we’d just finished the younger of the two, the 2004 Wings Cabernet Sauvignon (Napa Valley). 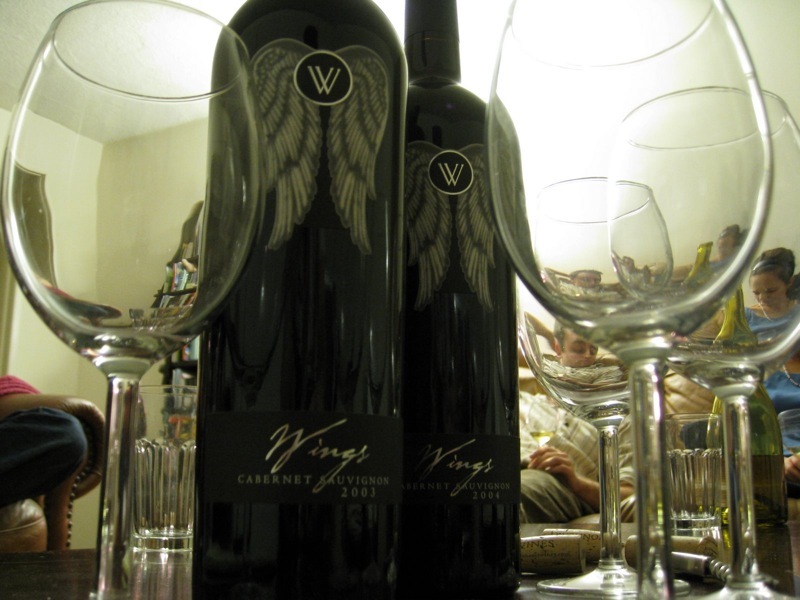 With the exception of Dylan, collective Wino opinion favored the first bottle, the 2003 Wings Cabernet Sauvignon (Napa Valley), which felt altogether more balanced and well-integrated. We found it interesting that, even after aging for a half-decade, there was still a noticeable difference in “youthfulness” between bottles produced only one year apart. Again, some of it may have been climatically-based… perhaps we just got lucky this time. However, until the next vertical flight comes our way, we’re going to go ahead and call ourselves masters of the side-by-side blind age evaluation game. Sasha and Leah keep it real on the Westside… Andrew explains why the wines would’ve been better if they were from Wisconsin… good Cab makes everybody smile.